I owe the thinking behind this article to James Tuckerman, who asked the right questions to help me see things from a different angle. There are so many feel-good reasons why you should start a podcast. 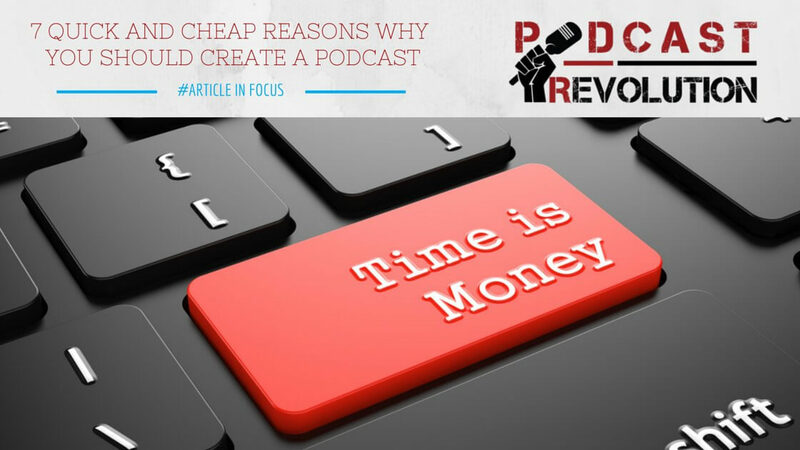 But, here are the reasons why a podcast will save you money as well as save you time. I suppose you will not become the next Justin Timberlake by starting a podcast, but stranger things have happened. Look at the success of the podcast “Serial”. Its creator is now a celebrity and she is famous. Very much like the writer of the Harry Potter books. Like I said, stranger things have happened. However, you will become a celebrity within your industry. I know a couple of celebrities within the tradesmen industry who started a podcast only 6 months ago. When you create a great podcast, your profile goes through the roof. It is the quickest way I know for you to become famous within your chosen circles. This might not be for everyone, but it is a place where you can start to make some money really quickly. The connection you make with your potential customers is priceless (see reason 5 for more detail). This allows you to authentically sell on products that would benefit your listeners. These products have to make your listener’s lives better by solving their biggest challenges and problems. And, the more you make your listener’s lives better and keep them in their happy place, the more you look like a rockstar baby (see reason 1). I cannot tell you how much of a pleasant surprise this was for me. The kinds of people I get to meet and have an hour long conversation with just astounds me. I got a chance to chat with the Director of baking at the culinary institute in New York, with a personal trainer for Hollywood stars, and with the world’s most popular blogger. Once you have a podcasting platform, you can invite anyone to come join you on it. And, it is the most cheapest and quickest way to make some pretty high profile friends. And, the more high profile friends you have, the more you start playing with the cool kids (see reason 1, again). There is no doubt in my mind that an audio podcast is the easiest way for anyone to consume your content. Take a blog and a video as alternatives, and you have to stop what you are doing and consume that content. With audio however, you can do other things like driving, running, or scanning documents for your paperless office. And if all you do is talk, apart from easy content consumption, it has to be a cheap and easy way to create that content. They say that a baby’s first developed sense is when it can hear its mother’s voice in the womb. Some of the biggest movements that have started on the planet began with a single, well delivered speech. The connection you make with your customers, or potential customers is unparalleled when they hear your voice. The number of blogs on the internet is in the billions and right now there have been over 1.5 million blogs published today (for real-time stats check here – http://www.worldometers.info/blogs/). There are over 2 million minutes of video being produced on YouTube every month. Compare that with the 250,000 podcasts on iTunes today and your competition is pretty much irrelevant – FOR NOW! People that are tuning into your podcast and listening are looking to listen to you and what you have to say. It isn’t like a billboard, a television advertisement or a newspaper article. They know why they are tuning in to listen and they want to be there. There is no better way to get a focused following in my opinion. And, if you factor in the connection you create (see reason 5), you have a winner instantaneously. I would love for you to disagree with me on anyone of the reasons above. Let me know what you think in the comments section. Also, help me increase this list. So, I’m doing research on podcasts before I jump head first into the medium. This is the first post I came across and glad I did. Of course, I feel like #6 could be irrelevant in the near future but time will tell.